The founder of Red Cross, Henry Dunant, was a Swiss citizen who had accidentally found himself in Italy at a time when French and Austrian victims from the Battle of Solferino (in 1859) were lying around uncared for. He quickly organised the women of the town to provide medical and transport assistance to the wounded. Dunant himself built temporary hospitals and arranged for decent medical supplies to be brought in. Then he asked captured Austrian doctors to work in those makeshift hospitals. Very soon after, Dunant wrote A Memory of Solferino and had it published in 1862. Its effect was quite a surprise in that many Europeans were interested. He described the carnage he had found in Soferino and described the efforts his team of volunteers had made, trying to help the wounded. Would it be possible to get an agreement between governments to give medical attention to the injured, wherever they fell (in battle or from natural disasters)? Would it be possible to create international treaties that would protect the volunteers, wherever they came from and whichever wounded they saved? The answer was a resounding yes! The International Committee of the Red Cross is a humanitarian institution that was formally founded in 1863 in Geneva, organised by Gustave Moynier, a prominent lawyer and president of the city's Society of Public Welfare,. The International Red Cross and Red Crescent Museum in Geneva holds the original document of that first Geneva Convention, signed by 16 mainly European countries. 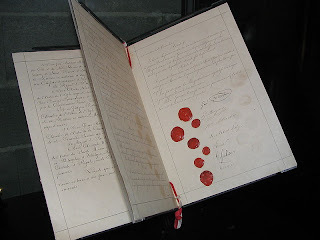 Agreements reached at the first Conference, 1863. Somehow, at that moment in time, all the nations of the world agreed to give the Red Cross authority under international humanitarian law to protect the victims of all wars! I cannot imagine the nations of the world ever agreeing to an organisation with international rights again. We know it was working - delegates of the International Committee visited the prisoners-of-war throughout the 1864-1914 era and, as noted in their reports, got improvements in conditions for captives on both sides. In order to not force their Islamic citizens to be carried in ambulances with Christian symbols on the side, Ottoman officials in 1876 requested that a red crescent be used to mark their ambulances and that the Christian cross would be removed. Thus the red crescent emblem was first used on Islamic ambulances during the war between the Ottoman Turks and Russia (1877–8). It took a while before the crescent symbol was accepted by the Red Cross Society, but it was formally adopted in 1929, and so far 33 Islamic states have taken it up. 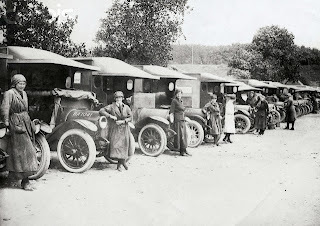 British women driving ambulances in France, World War I. “National” Red Cross and Red Crescent societies have always concentrated on natural disasters within their own borders. The “International” Committee of the Red Cross and Red Crescent Society, on the other hand, tended to concentrate on situations of warfare across borders. The International Federation of Red Cross and Red Crescent Societies was founded in 1919 and still coordinates activities between the all the individual national societies. The Federation Secretariat is well located in neutral, central Geneva. Jewish patients were probably not prepared to travel in ambulances marked with Christian crosses either, but they had a bigger problem than mere symbolism. There was a concern that the Jewish Legion of Palestine, a Battalion of the British Army who were fighting to liberate Israel from Turkish rule during WWI, needed medical help. 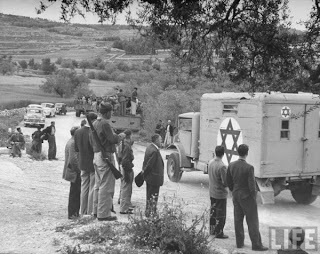 A Jewish ambulance service, called Magen David Adom/Red Star of David, was organised to aid both the Jewish Legion and the ordinary citizens. It was disbanded at the end of WW1. Magen David Adom (MDA) was not officially chartered until the vicious riots of 1929 against the Jewish citizens who had no access to professional first aid services. 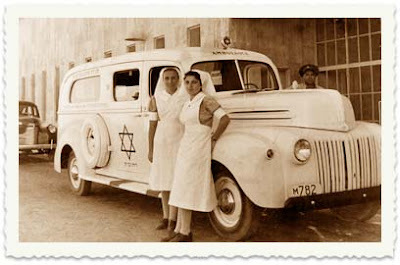 While still under the British Mandate, the organisation was founded in Tel Aviv in June 1930 by nurse Karen Tenenbaum, 7 Israeli doctors, one hut and one ambulance. They added a branch in Haifa (1931) and in Jerusalem (1934), then a nation-wide network of services was slowly introduced for Jews, Muslims and Christians, reaching a total of 600 ambulances. 5. a tracing service, to locate the children and grandchildren of families lost in the Holocaust. MDA currently funds c1,200 emergency medical technicians, paramedics and emergency physicians. But in Israel (as in other nations? ), MDA is mainly staffed by volunteers; 10,000+ of them. Today all volunteers complete a 60-hour course that covers many topics ranging from common medical conditions and trauma situations... to mass casualty events. Those who pass the course are then sent out across the country and work with local volunteers in ambulances. MDA headquarters and its blood bank are located at the Tel Hashomer hospital, a place I know very well since I lived there back in 1971 and 1972. The organisation operates 95 stations over the country, with a fleet of over 700 ambulances nationwide. Air ambulance service is provided by Israeli Air Force 669 unit with MEDEVAC helicopters. Naturally Magen David Adom applied for membership in the International Red Cross and Red Crescent Movement, as soon as it was founded and fully operational. But it was too late. The "Red Star of David" symbol was not submitted to the ICRC until 1931 and membership for new organisations and symbols was closed at the 1929 conference. The conference decided that if they allowed the Jews to have a red star, instead of a cross or crescent, the Buddhists would want a symbol of their own, the Hindus might request something different etc etc. The Soviet Union avoided the problem by accepting the Red Cross as their official emblem, in order to gain entry. Every attempt in the decades since 1931 to have Magen David Adom included in the International Red Cross and Red Crescent Movement failed. Until the American Red Cross became involved. The Americans stated that unless Jews, Christians and Muslims could all use their own symbol for their own citizens, they would withhold all administrative funding from the international organisation. From May 2000, the Americans did indeed withhold millions of dollars, until the Federation of Red Cross and Red Crescent Societies caved in. In June 2006, MDA was recognised by the ICRC and admitted as a full member of the International Federation of Red Cross and Red Crescent societies. 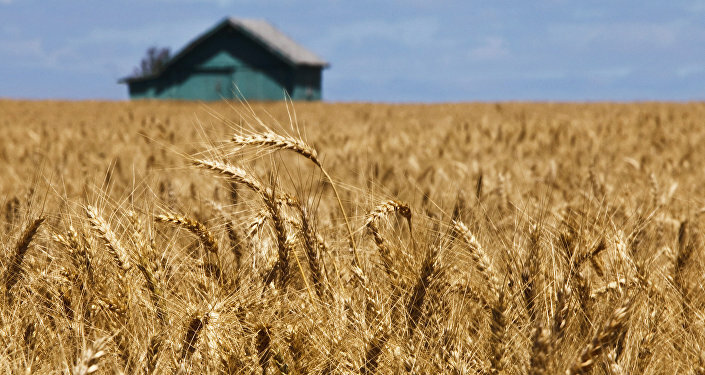 It had taken from 1931 to 2006, 75 long long years. Middle East Affairs Information Centre has a wonderful MDA poster from 1918 and a photo of the first modern ambulance being launched in 1931. 19th 20th Century History Images has a fine photo of Red Cross women running an ambulance service in 1928. For an excellent review of the founding of the Red Cross in October 1863 and its early history, see Richard Cavendish in History Today October 2013. 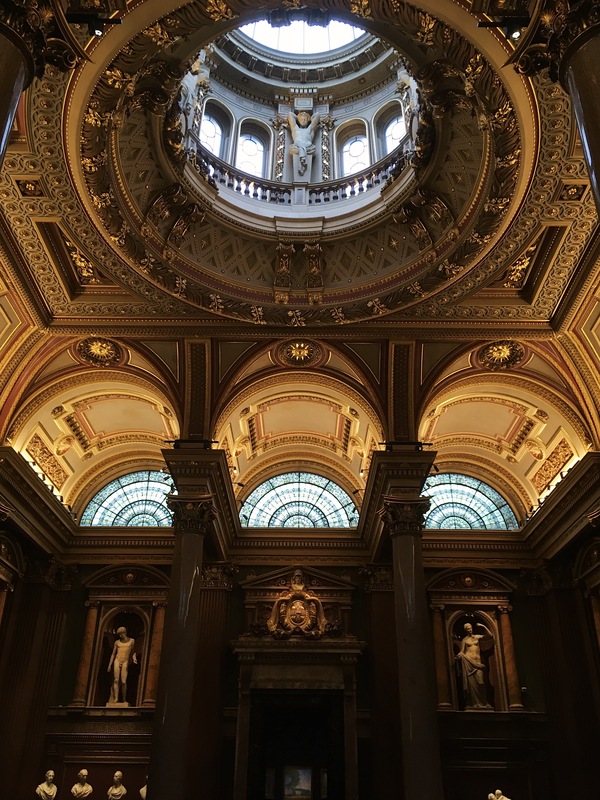 Of particular interest is the tense and destructive relationship between Dunant and Moynier. Moynier considered Dunant an impractical idealist and soon forced Dunant from his own movement!! Dunant was declared bankrupt and lived out his life in poverty. The only thing Moynier could not take away was Dunant's Nobel Peace Prize in 1901. Mott, right. We know from Florence Nightingale that more young men died from the post-injury care (or lack of it) than died from the initial wounds. So one wonders why it took till Henry Dunant, before a proper service could be mounted. It's so true that money talks. i.e.to prefer death than to ride in a vehicle with the "wrong" symbol painted on it seems patently illogical. I'm with Mott; I'd go on a camel if need be with any old tattoo on its side! I loved this article. My mum was a member of both Red cross and Magen David Adom in South Africa for many years. She worked mostly with Red Cross though as they did work in township clinics whereas Magen David Adom focused on covering Jewish activities (my mum is Jewish but I think she thought that the community was quite priviledged and she went where she thought she was needed) . She worked mostly in Alexandria Clinic which was in the black township of Alex near Johannesburg and she used to volunteer every Christmas and New Year when no one else would volunteer. It was quite funny as she used to work weekends too and she would pick me up from nightclubs very early in the morning in an ambulance and then we would drive back to headquarters to pick up her car. 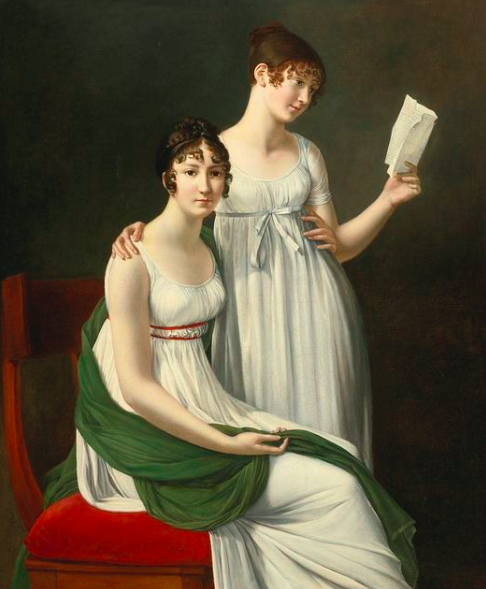 it is fascinating to me that Dunant specifically organised _the women_ of the town to provide medical and transport assistance to the wounded. In 1859, I would have assumed that middle class women couldn't normally go around town unsupervised. Let alone tend to wounded and filthy soldiers. Only by WW1 was it totally accepted that women could do this important work - I love the photo of the British women ambulance drivers in France during World War I. Your mother was in a long history of very fine heroic women. You know what Hels, I think I might tell her that. It would please her. I have added a reference to Dunant's important book, A Memory of Solferino, written after the battle and published in 1862. Without it, the International Committee of the Red Cross may not have met in 1863. Thank you for mentioning the 150th anniversary of the founding of the Red Cross movement. Henri Dunant was a hero, then a bankrupt failure, and now he is a hero once again. women were amazing! Great photos.